One of the most curious features in the division of the land described in Ezekiel 48 is the allotment of land to priests and Levites, because under the Law, they were to receive no inheritance of land. This was to be “a statute for ever throughout your generations, that among the children of Israel they have no inheritance.” [Numbers 18:23] Instead, the Lord was their inheritance. This was stated in Deuteronomy 18:2, Joshua 13:33 and 18:7 and in several other scriptures. Ezekiel’s description of the allotment of land to the various tribes in chapter 48 has to be interpreted; the promised land is symbolic in his prophecies. In chapter 48, his reassignment of the land to the various tribes does not correspond to the original allotments by Joshua, and takes no account of the topography. By assigning territory to the priests and Levites, Ezekiel’s prophecy alludes to the spiritual things that the land represents. The promised land has a spiritual significance, revealed in the fact that under the law, Levi’s inheritance was compared to the inheritance of land which the other tribes received: “the Lord God of Israel was their inheritance.” The privilege of knowledge of God, and the service of God, was in lieu of possessing land. The promised land, then, was symbolic of the knowledge of God. The following commentary on Ezekiel 48 by Frederic Gardiner, and the accompanying map of Ezekiel’s division of the land among the tribes, help to explain the areas assigned to the priests and Levites in Ezekiel’s prophecy. 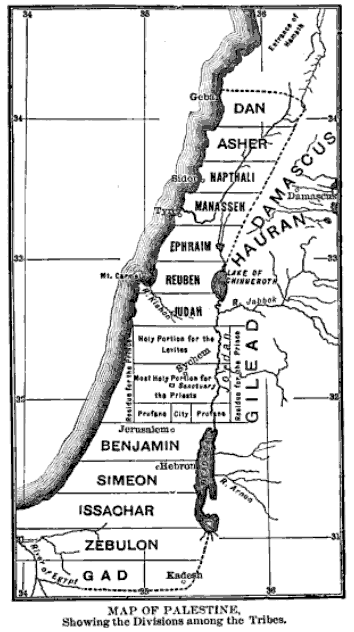 The distribution of the land is entirely different from that made under Joshua, nor is it easy to trace any historical reasons for it, except that the central portion, containing the Temple, the land of the priests and the prince, is flanked by the two tribes of the southern kingdom, Judah and Benjamin. The chapter can best be understood by the aid of a small map, the outline of which is traced from Dr. Wm. Smith’s ancient atlas. This might be drawn with the lines between the tribes perpendicular either to the general course of the Jordan, or to the general coast-line of the Mediterranean. The latter would give a little more width for the oblation, but still not enough, and would leave no space at all on the west for the prince. The former arrangement is on the whole preferred. It will be seen that the tribes are not arranged either according to their seniority or their maternity. The territory falling to each tribe was much smaller than of old, partly because of the large space occupied by the “oblation” (fully one-fifth of the whole), and partly because the remainder was to be divided among the whole twelve tribes, instead of among only nine and a half. Tho portion thus given to each tribe was rather less than two-thirds that assigned, on the average, by Joshua. (1) These are his sides east and west.—Lit., The east side, the west side, shall be to him, meaning that the portion of Dan stretches across the country from the eastern to the western boundary. So of them all. The original portion of Dan was at the west of Benjamin, but a part of the tribe having conquered Laish, and settled at the extreme north, Dan is now made the most northern of the tribes. Asher, Naphtali, Manasseh, and Ephraim are so far approximated to their old places as to be north of the sanctuary. (8) In length as one of the other parts.—The oblation, which has been already spoken of in chap. xlv. 1—7 in a different connection, is here (verses 8—22) more exactly described. Its whole width is again stated as 25,000 reeds, and its length from the eastern to the western boundaries of the land “as one of the other parts,” no account being taken in this of the varying distance between the Jordan and the Mediterranean. It cannot, however, be so placed as not to exceed that distance. (9) The oblation.—This is the same word as is translated offering in verse 8. It is used in this passage in three different senses:—(1) as including the whole strip from the Jordan to the Mediterranean and 25,000 reeds wide; (2) for that part of this set aside for the priests, and for the Levites; (3) for the most sacred part of this, appropriated to the priests and Temple, 25,000 reeds from east to west, and 10,000 from north to south. This last portion, although in the middle, is mentioned first on account of its especial sacredness. (10) In the midst thereof.—The whole connection shows that this is to be understood strictly; the sanctuary was to be not merely within the priests’ portion, but in its centre. (11) Sons of Zadok.—See Note on chap. xl. 46. As the Levites went astray.—That the Levites were far more affected than the priests by the general apostasy, may be reasonably inferred from the fact that at the restoration less than 400 Levites, and as many Nethinims, returned (Ezra ii. 40—58; Neh. vii. 43—60), while there were 4,239 of the priests. (15) The five thousand that are left.—The two strips of territory for the Levites and the priests, each 10,000 reeds wide, being deducted from the whole width of the oblation, leaves a strip of 5,000 wide and 25,000 long which is here apportioned to the city and its suburbs. It is called “profane” in contrast to the “holy” possession of the Levites (verse 14), and the “most holy” of the priests (verse 12), though it was still a part of the oblation. (16) The measures.—The city itself is to be an exact square of 4,500 reeds, and according to verse 17, was to have “suburbs,” or rather an open space on all sides of 250 reeds. The whole was, therefore, 5,000 reeds—a little less than ten miles—square, the exact width of the space that was left of the oblation, and leaving 10,000 reeds on each side of it. (18) Shall be for food.—This piece of land, only four times the size of the city itself, would seem a very insufficient provision for raising all the food required for the labourers of the city. But here, as everywhere, it is to be remembered that the description is ideal. (19) Out of all the tribes of Israel.—The city itself is no longer, as of old, to belong to any particular i tribe, but is to be situated on the common oblation, and its labourers are to be taken alike from all the tribes. Thus the old jealousies are to be extinguished, and in this, as in all other respects, each tribe is to be treated like every other. (21) The residue shall be for the prince.—The length of the oblation from east to west is supposed to leave a strip at either end which is assigned to the prince. This strip is to extend from north to south, the whole width of the oblation. The expression “over against the portions for the prince” is somewhat obscure from its extreme brevity and want of punctuation in our version; it means that the part of the oblation over against the tribe portions shall be for the prince—i.e., he is to have all that is left of the oblation between it and the portions assigned to the tribes. As already said, this was geographically impossible on the estimate of the length of the cubit here adopted. Even if the cubit were reduced to eighteen inches, which is the smallest estimate that can well be made, the side of the oblation would still be 42 + miles long, or more than the distance between the Jordan and the Mediterranean at its northern end. It is quite idle, therefore, to attempt any calculation of the prince’s portion. The description is necessarily ideal, and no hint is given in the vision of how much was intended for the prince. If it be suggested that the prophet may have had in mind measures following the uneven surface of the ground and the sinuosities of the roads, it can only be replied that such a supposition at once, destroys all possibility of following his measures, and is singularly opposed to the whole symmetry of his. description, as well as inconsistent with the equality of the measure on the four sides. (23) The rest of the tribes.—In verses 23—29 the remaining five tribes have their portions assigned on the south of the oblation in precisely the same way as the seven on the north. (30) The goings out of the city.—In verses 30—34 the dimensions of the city are again given for the purpose of introducing the mention of the gates, three on each side, one for each of the tribes of Israel. In this enumeration Levi takes his place as a tribe, and Joseph is therefore reckoned as only one tribe; but the order of their names is neither that of their geographical arrangement nor of their seniority. It will be remembered that the symbolism of the twelve gates enters also into the vision of Rev. xxi. 12, 21. (35) Round about eighteen thousand.—The circuit of the city, not including its “suburbs,” or open space, was 4 x 4,500 = 18,000 reeds, or something over thirty-four miles. Josephus reckoned the circuit of Jerusalem in his day at four miles. Measures.—This word is rightly supplied from verses 30, 33. On the symmetry of the city and its gates and the names of the gates, comp. Rev. xxi. 12, 13, 16. The Lord is there.—With this name of the city Ezekiel closes his vision and his book. It is a most fitting close; for the object has been to depict, under the figures of the Jewish dispensation, the glories of the Church of the future. The culmination of this glory must ever be that the Lord, according to His promise (John vi. 56), will dwell in the believer, and the believer in Him. Imperfectly as this may be carried out here on earth, the effect of the Gospel is to bring about ever more and more fully its realisation; and the closing book of the volume of Revelation, catching the echoes of Ezekiel’s prophecy, looks forward to the Holy City, the New Jerusalem “coming down from God out of heaven,” and declares, “Behold, the tabernacle of God is with men, and He will dwell with them, and they shall be His people, and God Himself shall be with them and be their God” (Rev. xxi. 2, 3).